Ask Joy: ASKS YOU! Desperate Damsel? Since we know there may be varying opinions due to different personalities, I thought it might be good to directly ask you this question so you could shed some light for our female readers. It’s along the lines of the question I answered a few weeks ago in an Ask Joy Video. I met an amazing man last month who I really like a lot! How do I let him know I’m interested in him, while not looking desperate? So guys…if a girl decides she doesn’t want to be the one to ask you out, how should she let you know? And what would make you give it a shot? Send him a tweeet! Oh, I kid. Engage him in conversation and get him talking about his favorite topic: himself. I’m not saying it’s comfortable, but if you ask him what makes him tick, I think he’ll get the hint. If not, kick him in the shins until he sees you. I’m sorry, I don’t know what “looks desperate” other than dressing in strings and sauntering about. @ron, I think finding out what makes other people tick is always a good interpersonal communication approach. Thanks! What’s wrong with desperate? Why not honestly admit that you want to be submissive to a man and are eager to enter that season of life? Why do we think this is unattractive to men? If you’re talking to the right guy, he will actually be attracted to that role! @Gideon, I think @Duke pulls out the “food” card in the comment below too. Thanks for sharing your story! Would love to know if you and your girlfriend agree or have further thoughts. yay! i’m excited to read the responses. sometimes i forget if it was me that submitted the questions because they sound like questions i’d ask! @sarah, haha…Maybe it was you! I agree with Ron – get him talking about his favorite topic/hobby. If you can find out what he enjoys doing – then just ask him to take you along so you can check it out. For me that would be hunting, hiking, shooting, baseball, off-roading, camping, fishing, etc. If any girl said she wanted to me to teach her how to shoot after we go off-roading… I would clear my calendar! At least that is what worked for my wife! @Justin, Good to know. I think lots of guys say they are looking for a buddy and best friend in a wife, so it makes sense that you would want to share the things that you love to have your buddy on board for! A few things come to mind. First: Let him know you remember everything he tells you about his life. When a guy is interested in a girl he does as well. But that says much in way of interest in a person. Second: Sit next to him at lunch/dinner or at events if you both came solo. Choose to be next to him when you have a choice of several places to sit. You don’t have to sit there long. But it helps a guy to know you are willing to sit next to him. Some guys are that dense. Yet some guys pause to think about the fact you would be willing to sit next to them. If he is the coolest guy in your town and the girls are always in his space…do not sit next to him! Go to third option! Third: Don’t be afraid to disagree in public with this guy you have interest in. It often leads to more conversations and a might improve his opinion of you in many regards. In all of this be genuine. Forth: Watch as much old BBC films as possible. I think of Miss Elizabeth Bennett on the 1995 Pride and Prejudice film. Though she has faults in her prejudices, she does engage the men she has interest in. I enjoy that most about the film. She really struck a good balance with interest and engagement. Jennifer Ehle does a masterful job in her role as Lizzy. The film gives one much to ponder when thinking thru your approach. Times have changed for sure…but can you modernize that Lizzy character and bring some of her ways into your modern situation? A man who can converse about the nuances of P&P? Can I sit next to you at lunch? @James Small, I love the BBC version. So good. I am always up for a good debate. For me it’s important to know when I am debating and when a guy feels like I am dishonoring him or shaming him publicly. I think “how” we argue or debate is key. p.s. Great seeing you at Ben’s wedding! Sorry for my slow “out of tweeter world” context recognition. For me personally, I begin to feel comfortable to pursue when a woman begins to treat me with partiality. Nothing seems to be less attractive when a girl seem to act “guy crazy”. Treat the guy that you are interested in differently than other guys that are around. Like James said, sit next to him when you can. Show him you are interested by asking him about himself. Nothing for me personally seems to boost my confidence or is more attractive than whan a woman affirms my masculinity. Mainly, just be confident. And I don’t mean confident in yourself but rather Christ. God will provide, so there is no reason to sweat over it. @Brent Butler, I like this Brent. One thing I usually tell women is to be friendly to everyone since I know some women can pull back or shut down if they actually really LIKE the guy. I think the other extreme is what you mention. Basically – we need to be authentic, friendly to everyone and not be fearful of showing a little extra special attention so the guy gets the clue that you mean more to us then other guys. (-: Would you agree? I think that when she can drop hints that is helpful. Not like a spotlight with our name in the sky. If there is active communication and she reciprocates but shows some intentionallity in her talking to him, but also engages him and shows interest of “I would like to know about you” that’s huge. If you’re interested do not play the hard to get game because you might make yourself too hard to get! If there is a kindness in her subtlety but makes it clearly directed to him after some time he will get. Or if you just kiss him then he might get the point of you being interested (just kidding, really). Good luck! @Chris, Haha…that could be one approach. I think in the same way a girl should be careful about not playing TOO hard to get, a guy must also read clues if she is showing she is not interested romantically. Oh the dance we do! No body can do it perfectly. Let’s call this comment “Advice From The Chronically Single.” Hint dropped. Grain of salt taken. Thank you. I think what a lot of the insightful folks above me have already commented on can be boiled down into two basic things. 1.) Show some genuine interest in the dude. And it shouldn’t be like, ‘IT’S THE GUY YOU LIKE HOUR, WHERE ALL WE TALK ABOUT IS HIM AND WHAT HE LIKES.’ There obviously should be some give and take there… you know… a real conversation. And if there’s real mutual interest there will be. The important thing is to convey that you wouldn’t mind getting to know him. 2.) Do not be too stand-offish for the sake of being demure or modest. It’s one thing to let the guy pursue… we like that, (or at least I do,) BUT it’s nice to get a vibe that we aren’t completely wasting our time. I like Gideon’s ‘pulling a Ruth’ thing. And it doesn’t have to be complicated… one barometer I use when working up the nerve to call on a young lady is how big her smile is whenever we meet. If I get the vibe that she’s just being friendly, I may not want to put myself out there to pursue a more-than-friendly sort of relationship. Also, food. We like food. What, I have to be the guy that says it? 2) I like what you say about “not being stand-officsh for for the sake of being demure…” Sometimes, we forget the balance. @Duke, I love this! Well, the food part is awesome and we know from @Gideon’s comment that it works. @JOY, Thanks for steering me to those videos. Awesome. I think you pretty much hit the proverbial nail on it’s head with the whole ‘being available’ thing. At least, it made sense when you were talking about it. The super-happy-friendly-smile-time-hour is generally my cue to realize that a lady might not hate a little attention. When girls are trying to be mysterious, I am just too oblivious to pick up on it. The part that REALLY resonated with me, though, is the second part of this series on Fear. Since you seemed more comfortable talking about the female perspective than the male, I’d like to assure you that it rang true to me. We dudes are generally too macho to admit to our own insecurities, but the rejection thing is a total ego-crusher. I’d say that’s just the immediate cause, though. The tip of the whole ‘Am I Good Enough For Her’ iceberg. This actually inspired me to write a way-too-wordy blog post on why the whole ‘desperation’ thing scares me, (and I’m assuming other guys,) off. I have absolutely no call to write on dating advice, (btdubs, mad props in your direction,) but this thread inspired me. SO THANKS. And give Walter a break. The Luck Dragon look? Pulling. It. Off. It seems like men don’t mind if you initiate your interested. What kinds of ‘hints’ are guys looking for? What kind of initiations are appropriate for women? @Katy, I think it can be quite simple for a lot of these guys. I’m hearing “food”, “smiling”, “sitting next to us”, etc. I’m loving the comments and stories. Thanks guys! To the woman that “asked Joy” – This is a great question to ask. Desperate isn’t attractive. Ever. Well, that’s not true. Some men really like desperate. But hopefully those aren’t the men you’re interested in. If you are, know that you can do better. While desperate isn’t attractive to most guys, interested almost always is. In “Who Pursues? Part 2,” Joy talked about men and their fear of being rejected. She’s right. Rejection hurts. And it only has to happen a few times before it becomes a nearly involuntary (and perhaps irrational) fear that emerges each time a man considers pursuing a woman. Of course, this fear is borne out of a lie that says our value and identity as men are dependant on her response to our pursuit. The truth is that our value and identity come from God alone, and we will never find them in women or relationships. Still, this fear, finds ways to persist. This is why it is so attractive when a woman makes her interest known. Her expression assuages his fears by speaking to his masculinity (even though that isn’t where he should be looking for it). It reduces the perceived risk. And more than that, it actually clears the way for a man to act on his deep desire to pursue a woman. Which in turn, fulfills her desire to be pursued. 2. Be intentional. If your goal is for him to know you’re interested, don’t treat him like just another guy. Make an extra effort. Ask good questions. Or perhaps you could do something nice for him; without going overboard. 3. Be available. This may sound eerily similar to my first point, but rest assured it is different. Whereas point #1 is about physical presence or relational proximity, this is about relational availability. (Joy talked about Ruth and Boaz as an example of this idea.) You need to make yourself available and give him the opportunity to pursue you. Don’t play hard to get. 4. Be confident in who God created you to be, and be yourself. Trust that He got you right. You are fearfully and wonderfully made (Psalm 139:14). Don’t try to be what you think a man wants you to be. If he doesn’t want you to be you, don’t waste your time. Lastly, know that men don’t always get the messages and hints that women send. You may think you are being ridiculously obvious, but he may still have no clue. Sorry. It happens. 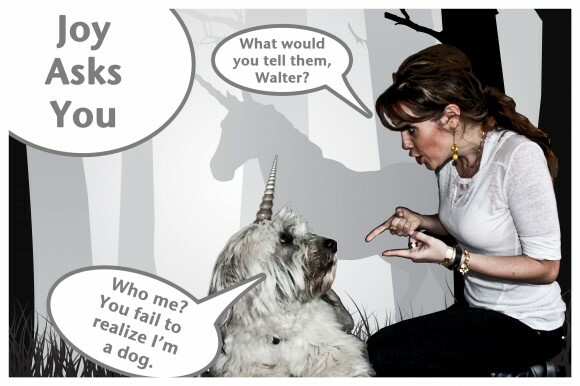 Side note for Joy: Walter makes a very convincing unicorn. @Robby Larson, This is so good and clear. You should probably make it into a blog post! @JOY, Thanks! When I got done writing, I realized it ended up being more of a blog post than a comment. What can I say? Sometimes I just have a lot to say. And someday it may find new life on my blog (if I ever finish the redesign). For Pete’s sake guys don’t over complicate this issue. It’s complex enough. Simply let the guy know with small hints if you must. ( i.e. hey your kinda cute, that stuff you do is pretty cool–referring to a hobby or activity, etc) just don’t over do it. Than “stop, drop and roll.” In other words…let it go and let God. If he doesn’t get the hint…trust me he ain’t the one! Best wishes and always pray for piece of mind….that His will be done. You don’t need to “ask him out” to get to know him. Just invite him to do something. Definitely do not “ask him out.” Unless he is on the exact same page as you it may ruin his chance to see you as a friend and when that tide shifts it shifts for good. I don’t know you, but if you are looking for a best friend and a boyfriend let him see you as a friend first. Don’t believe that crap about “once he sees you as a friend you’ve missed the window.” That’s motivated by fear, not confidence and courage. Go with the courage.